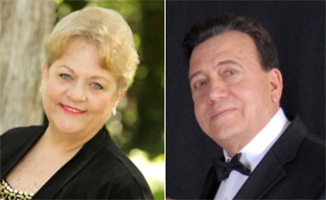 WICHITA, KS (Dec. 16, 2018) Wichita Grand Opera’s Founders, Margaret Ann Pent and Parvan Bakardiev, decided to retire from the Wichita Grand Opera effective January 1, 2019. They established the first professional opera company in the State of Kansas from 2000 through 2018. For 18 years, they were striving to maintain the WGO Mission Statement: “To produce opera and opera education programs at the highest artistic level to enrich the cultural lives of Kansans.” This will conclude their 45 years of service to the opera and performing arts industry both in Europe and the United States. The City of Wichita and the State of Kansas have been culturally enriched through their artistic vision and financial stewardship. Under their leadership the company became known for producing high quality, traditional, and rarely produced operas, on a modest budget. They have produced more than 60 operas and 7 gala concerts, with internationally renowned opera stars, Kansas natives, and aspiring artists. Statistics have shown that circa 1.5 Million viewers from more than 200 countries worldwide, have watched WGO opera productions which were placed on YouTube down through the years. Additional programs they created during their tenure were: the annual Opera on the Lake at Bradley Fair; Classical Ballet Presentations; Opera Touring Program to cities in Kansas – Hutchinson, McPherson, Overland Park, and Salina; the annual Opera Ball; annual Main Stage Auditions, and the auxiliary organization, the WGO Opera Guild. Adult Opera Education Programs – (1) Young and Resident Artists Programs, (2) Opera Academy of the Midwest, (3) Pre-Performance Talks, (4) Night at the Opera for corporate employees. Children Opera Education Programs – (1) Final Dress Rehearsals for Students, (2) In-Schools Opera Vignettes, (3) Children’s Opera Coloring Book Competition, (4) Day at the Opera with Backstage Tours. Wichita and Kansas residents thank the Founders of WGO for their service, and bids them farewell.